Main Regions: Colalao del Valle. Main Varieties: Malbec, Cabernet Sauvignon, Syrah, Tannat, Bonarda and Torrontés. Grapevines are grown at altitudes ranging between 1,800 and 3,000 masl (5,900 and 9,849 feet, respectively) in the Calchaquí Valley, one of the highest valleys in the world, which this province shares with the provinces of Salta to the north and Catamarca to the south. 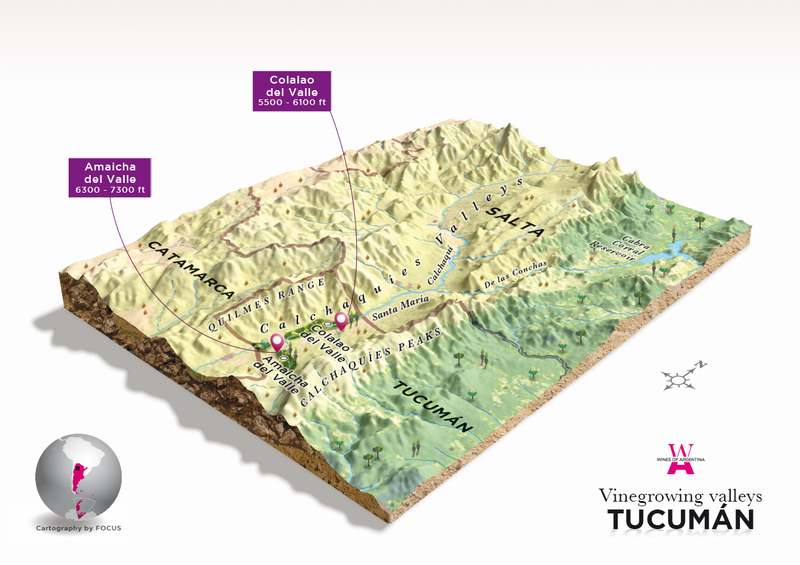 The areas of Amaicha del Valle, Colalao del Valle and Quilmes, where the vineyards are, belong to the Tafí del Valle department, which, with 14,933 inhabitants scattered over 2,741 km2 (1,060 sq mi), is the least densely populated area in the province: 5.4 people/km2 (14.04 people per sq mi). Grapevine varieties planted in Tucumán include: Tannat, Malbec, Syrah, Bonarda, Cabernet Sauvignon and Torrontés. The last two excel due to the outstanding balance achieved between the identity conferred by the Calchaquí terroir and the typical features of each variety. The sun’s strong influence, the soft winds that constantly blow from North to South and its sandy loam soils, permeable and deep, along with its thermal amplitude, make up for the wines in Tucumán: bright colors, simple and spicy aromas along with sweet, fruity flavors with balanced alcohol. They are strong, structured wines. The sum of its climatic conditions merged with the soil, altitude and the purity of the melting water, create wines of first-class quality. In addition, an organic working method is practiced.